A tourist by name Michael Fujiwara was sitting on a deck at the Stevenson Fisherman's Wharf in Richmond, when a sea lion grabbed a little girl and dragged her into the water. 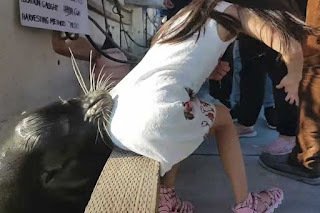 Fujiwara grabbed his phone and started shooting video, the animal attracted a lot of attention by inflicting fear in the tourists, which called the attention of the girl's family to the dock. 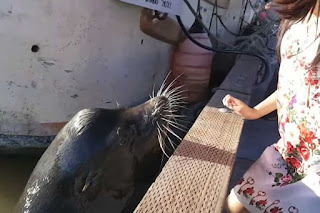 At one point, the sea lion lunges within inches of the little girl's face, which seemed first as a friendly move but turns to terror a few second later when the sea lion grabbed the girl and yanking her backwards into the water. 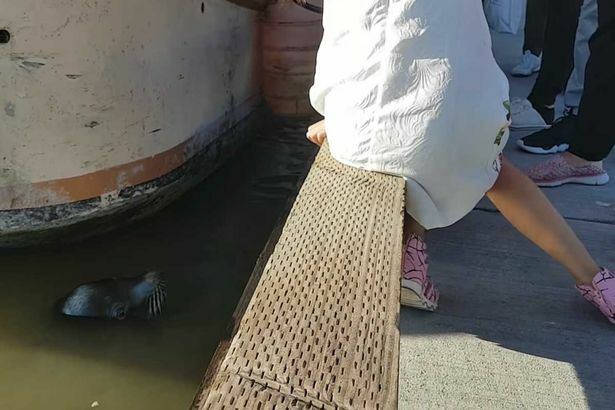 A man who is a relative of the girl, jumps in after her and bystanders pull them to safety. Bob Baziuk, the general manager of the Stevens Harbour Authority, told CNN that the girl and her rescuer were not hurt and warned visitors not to feed the animals as "it's not sea world".